Tigers on the Hunt: Kursk gets a Twitch Stream! 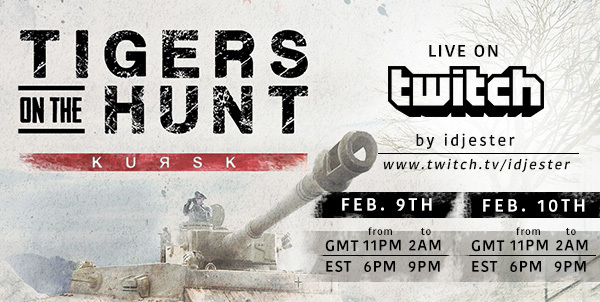 Status: offline Tigers on the Hunt: Kursk will be released tomorrow, and to celebrate this important occasion, our friend Idjester will stream the game on his Twitch Channel on Thursday Feb 9th from 6:00-9:00 pm EST and again on Friday Night from 6:00-9:00 pm EST! Status: offline And I have 2 FREE DLC keys to give away thanks to the publishers Matrix Games and Slitherine. So come over and watch the DLC live and in person and you could also walk away with a free copy of the DLC pack. One free copy each night. Thanks Matrix Games and Slitherine for your support!!!! Status: offline I know I'll be picking up a 6 pack and some chips and salsa for this event! Too bad I can't figure out why I can't open an account with TwitchTV so that I can comment but watching is good enough. Thanks idjester for your dedication to gaming, especially TotH. Status: offline If you can't comment, you can't win the prize.... Work on getting an account on twitch if you have the time, would love to hear feedback. Thanks for the comment guys, see you tomorrow night!!! Status: offline That's going to start a bit early for me but I hope to catch it for the last hour or more. Status: offline Enjoyed it IDJester, especially when you did it, did it now! Uploading to my youtube channel right now, once finished you should be able to watch it... Great time for all I hope, lots of interesting action. Great campaign scenario, look forward to tomorrow night. Hope you can all make it tomorrow as well. Thanks for everyone that came out tonight. Status: offline I missed it, but it was not my fault: I was relaxing on the bank of the Psel river when a bunch of bad guys started firing at me . I'll watch it on YouTube later today: thanks in advance, I'm sure I'm going to have great fun . Status: offline Good job IDJ!! Status: offline Thank you, Matrix for giving Idjester some keys to hand out. He did an excellent job on the stream! I came oh so close on the first night of winning a key, but the second night had too many smart people for this old fart to have a chance. Please consider allowing Idjester to do more things like this in the future. He's an excellent ambassador for Matrix type games! Status: offline Great show Idjester. I have watched thursdays twitch stream on your Youtube channel and had great fun. I'll watch Friday Stream later today. Great show Idjester. I have watched thursdays twitch stream on your Youtube channel and had great fun. I'll watch Friday Stream later today. Status: offline Hey everyone... thanks so much for the great words. I am glad I could host this game for everyone and hopefully everyone had a great time and learn lots of great things while playing. I hope to continue playing if people keep coming to watch. If you subscribe to my twitch/youtube you should be able to keep up when we are running live. It was great fun having everyone and lots of great comments and interactions. And a big (super huge infact) thanks to Slitherine/Matrix Games for supplying me with 2 free copies of the DLC to give away. That was very exciting and made a couple of gentlemen very happy. So again a big thanks to them for their great support on this live stream. And one of questions to win a free copy of the DLC pack was -- what is the name of the devoloper who made Tigers on the Hunt? That was to simple, right? Status: offline And the second one was day two was also a good one:" What is the name of the Operation that the Kursk DLC is taken from" or something like that.